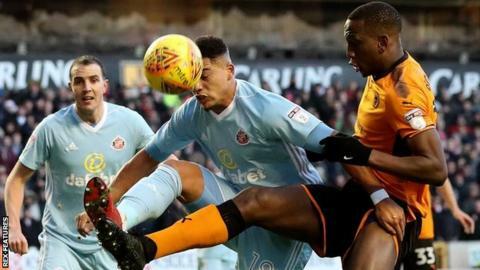 Championship leaders Wolves were held to a goalless draw by 10-man Sunderland at Molineux. The hosts went into the game after six successive victories, but Leo Bonatini's missed effort was as close as they came in the opening 45 minutes. The Black Cats were reduced to 10 men when midfielder Lee Cattermole was sent off after picking up two yellow cards in as many minutes. Wolves pushed on for a winner but had to settle for a point. Despite failing to extend their winning run, Nuno Espirito Santo's men are now eight points clear of third-placed Bristol City. It seemed likely that they would go on to claim a seventh straight win when Black Cats midfielder Cattermole picked up a second yellow for a poor challenge on forward Diogo Jota. However, both Ruben Neves and Ivan Cavaleiro were unable to make the most of chances as Sunderland held on for a vital point. Chris Coleman's men remain in the relegation zone but are now just one point behind 20th-placed Bolton. "It is disappointing because it is not the result we wanted but frustration, no, it is part of football. "Victories are hard to achieve and we work hard to achieve that. The boys did everything. They kept trying. There was only one team looking for the three points. "But I am not frustrated and I'm conscious games like this will happen again and we have to find solutions. I'm not worried about the game plans of opponents." "I told the players there were two things they could do, duck it or face it. I wouldn't advise ducking it because, even if you don't get what you want, at least you have a bit of peace of mind if you face the challenge. "After last week where everything's going right and then we have a man sent off and end up losing 3-1 you could easily come here and crumble but we didn't do that. "We have eight or nine players unavailable but it's about the boys who are available, ready and standing up for themselves and that's what they did." Match ends, Wolverhampton Wanderers 0, Sunderland 0. Second Half ends, Wolverhampton Wanderers 0, Sunderland 0. Corner, Wolverhampton Wanderers. Conceded by George Honeyman. James Vaughan (Sunderland) wins a free kick in the defensive half. Substitution, Sunderland. Elliot Embleton replaces Lynden Gooch. Attempt missed. Ivan Cavaleiro (Wolverhampton Wanderers) right footed shot from the left side of the box misses to the right. Attempt saved. Ivan Cavaleiro (Wolverhampton Wanderers) right footed shot from outside the box is saved in the centre of the goal. Assisted by Rúben Neves. Attempt saved. Diogo Jota (Wolverhampton Wanderers) left footed shot from outside the box is saved in the bottom left corner. Assisted by Matt Doherty. Attempt blocked. Willy Boly (Wolverhampton Wanderers) left footed shot from outside the box is blocked. Assisted by Alfred N'Diaye. Attempt missed. Diogo Jota (Wolverhampton Wanderers) left footed shot from outside the box is high and wide to the left. Assisted by Rúben Neves. Substitution, Sunderland. James Vaughan replaces Lewis Grabban. Attempt saved. Rúben Neves (Wolverhampton Wanderers) right footed shot from outside the box is saved in the centre of the goal. Assisted by Ivan Cavaleiro. Tyias Browning (Sunderland) is shown the yellow card for a bad foul. Substitution, Sunderland. Brendan Galloway replaces Donald Love because of an injury. Attempt missed. Rúben Neves (Wolverhampton Wanderers) right footed shot from outside the box is too high. Assisted by Matt Doherty. Substitution, Wolverhampton Wanderers. Hélder Costa replaces Barry Douglas. Lewis Grabban (Sunderland) wins a free kick in the defensive half. Attempt saved. Diogo Jota (Wolverhampton Wanderers) right footed shot from outside the box is saved in the top right corner. Assisted by Léo Bonatini. Substitution, Wolverhampton Wanderers. Alfred N'Diaye replaces Romain Saiss. Lewis Grabban (Sunderland) wins a free kick on the right wing. Attempt blocked. Romain Saiss (Wolverhampton Wanderers) left footed shot from outside the box is blocked. Assisted by Léo Bonatini. George Honeyman (Sunderland) is shown the yellow card. Second yellow card to Lee Cattermole (Sunderland) for a bad foul.